Pietersite is a member of the Quartz family, a silicon dioxide mineral, its crystal system is hexagonal (trigonal). It forms in masses that are pseudomorphic Jasper inclusions after asbestos. It is characterised by dramatic chatoyance and contrasting colours that include shades of gold, brown, grey, blue-grey and black, as well as occasional clear colourless areas. Pietersite is found in South Africa and China. Pietersite is said to activate the mind and imagination. It may help one to become fearless and overcome uncertainty and indecision. Pietersite is believed to stimulate the physical body, lending energy and strength. It said to be nervous system stone and is useful in stimulating and strengthening the nerves and the brain. Pietersite - Blue and Golden Tigers Eye folded in Quartz, mineral crystal tumbled for a smooth finish ideal as a pocket stone. 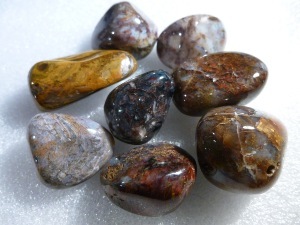 Pietersite tumbled to a smooth finish, an ideal pocket size stone, small enough to carry around with you. Tumble Stones can also be placed around the home for their energies or can just be nice decorative items. 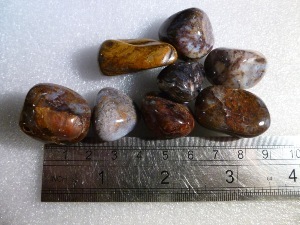 Pietersite crystal gemstones of varying sizes selected specially for your order.